Today I am joining Sunday Favorites with the fabulous Chari @ Happy To Design. This is a post that I ran last year showing a bathroom redo on a really tight budger. In fact for $28 total. Since we are all pinching our pennies, I thought this was worth repeating. Today I would like to show you my bathroom transformation, sorry I don't have a before picture.. However since I think someone somewhere made a mold of this bathroom and gave it to every builder in the country and they just stamped them out by the hundreds or thousands, a picture probably really isn't needed. It's the standard big mirror, cultured marble counter, sink and tub surround with basic cabinetry and the cheapest faucet they could find. I have had my decorating skills challenged with having this bathroom in my last two homes. With a new home and many projects that need to be done and the fact that my money tree is suffering from extreme drought and frost bite, I really needed to be creative. I started digging for accessories and decided a tropical theme would be in order. So armed with a plan I mixed 3 colors of leftover paint together for the walls, $18 for 3yds. of fabric for the drape, $5 for the bamboo rod, $3 for the tissue box I painted with a bamboo design, and $1 each for the soap box and mirror from the Dollar store. The clock and vase I had and the floral arrangement was made from remnants of several older ones. It may not be a remodel, but for now it will do and I really like the color and tropical feel that it has. Just another example of what we can do using what we have and using our imagination and a budget price of $28.00. Thanks for stopping by, and don't forget to link up Monday evening for Table Top Tuesday. Isn't it amazing what we can come up with when we want to make a change? Your bathroom turned out great. I hope you and yours had a fantastic Thanksgiving. This is great, Marty. I love the theme. It's nice that you were able to make so much yourself! I do envy the size of your bath...mine is half the size! Marty! Sooo pretty! LOVE IT!!! But then i love everything you do! Glory, what an amazing and it's just beautiful. To top it all off...it's on the cheap. Does life get any better than that??? God bless ya'll and have a wonderful weekend! really pretty . love the towels and shower curtain and floral ..
Hey Marty-I have been a short break and have missed visiting! This was worth repeating. I love "shopping the house" and moving things around to "spiff" things up. This looks great! Hope you had a happy Thanksgiving! Since I wasn't blogging last year, I didn't see this makeover!! I love it! Anything on a budget is my way of thinking! I am amazed at we can all do to make things better until we have the money to do what we really want! AWESOME!!! You are SO a girl after my own heart!!! And thanks to YOU I have been 'Briwaxing' everything in sight! LOVE that stuff!! Thanks for that post about it! Your bath looks very pretty! I like all the neat things you did! I also have the wide mirrors and I like them even though the smaller framed ones are prettier. I just like the brightness the big mirrors give, and they make the room look bigger! Sooo happy to see you for Sunday Favorites this week, my friend! Ohhh...and what a treat! I remember this sweet post! I still just stand in awe...that you were able to create and design such a beautiful custom look for mere pennies!!! 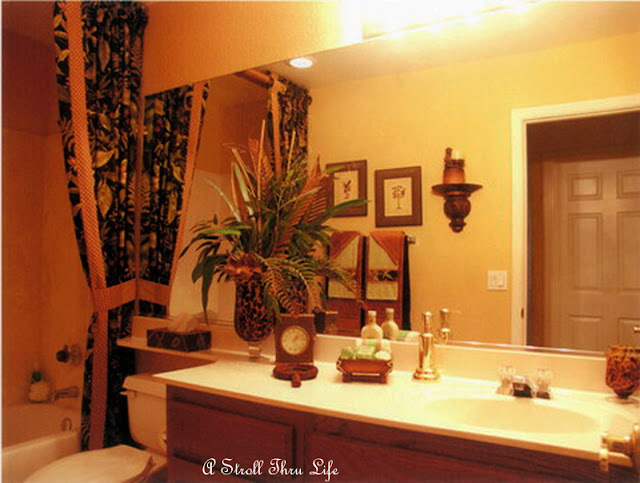 I just think it's wonderful that you posted this pretty bathroom...it just goes to show that with a little imagination and elbow grease...a remodel is entirely possible without breaking the bank! Such an inspiration, my friend! I love the tropical design that you used! Love the bamboo rod and that fabric is gorgeous! Ohhh...and I love, love, LOVE the beautiful floral arrangement that you created! Marty, you really are such a talented lady! You make some of the prettiest floral arrangements that I've ever seen!!! Well my friend, thank you sooo much for sharing this fabulous post with us for Sunday Favorites today!!! Well, as far as I'm concerned, you can NEVER go wrong with a tropical theme — even in the desert! I looked back at your Christmas decor from last year and all I can say is WOW!